The rambutan is a close relative of the lychee (Sapindaceae family) and an equally desirable, delicious and nutritious fruit. 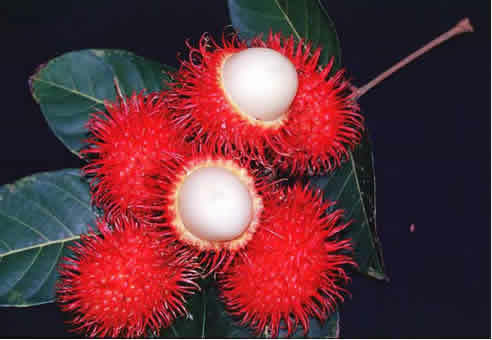 The word "rambut" in the fruit name 'rambutan' is Malay for 'hairy,' and this refers to the spiky rind. Without the soft spines on the rind, the rambutan would resemble the lychee. Within is the white or rose-tinted, translucent, juicy, sweet flesh, 1/6 to 1/3 in (0.4-0.8 cm) thick, adhering more or less to the ovoid or oblong, somewhat flattened seed. The fruit comes packaged in 6 lb boxes. The diplayed price is for a 6 lb box of Rambutans. Be sure to select 1st or 2nd day air shipping as the fruit is very perishable.